A group of French and German engineers are one step closer to creating lightning on command. The team fired pulses from an extremely powerful laser into clouds above New Mexico recently. 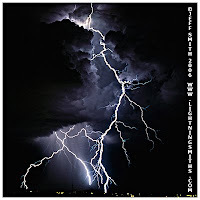 The pulses caused an increase in the electrical activity in clouds that precedes a lightning strike. The activity was too weak to create actual thunderbolts, but the scientists believe faster, more powerful laser pulses will do the trick. They hope to use this technology to "disarm" thunderstorms by draining their power before they reach sensitive sites, such as rocket launch pads housing satellites.